All transactions are safe and secure with a reliable history in online purchasing behind each of our associates. Buy the Donkey Puft t-shirt to own Ghostbusters clothing and merchandise. 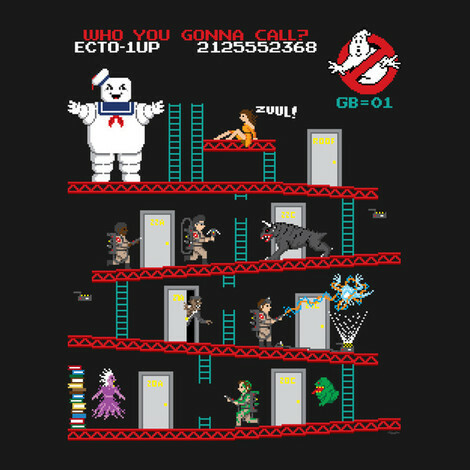 This Ghostbusters Donkey Kong t-shirt features the guys trying to make their way up a Donkey Kong game screen in order to rescue Dana from the Stay Puft Marshmallow Man. Don't let the paranormal win the game. Wear this cool piece of Ghostbusters clothing to let everyone know that you can bust ghosts too and not just answer phones at the firehouse like Janine Melnitz (Annie Potts). When a call comes in, grab your proton pack and hop behind the wheel of the Ecto-1 Ghostbusters car. Just don't get slimed. In addition to the Donkey Puft tee above, browse the Ghostbusters Clothing Gallery for more apparel like men's and women's clothes, kids shirts or hoodies.